I’m in Phoenix this weekend to teach our annual “Speak, Write, Promote” workshop and honestly, it’s been nice to have a distraction from the grief that gets triggered by so many memories of our sweet little cat, Poupon, at home. This week, in lieu of a blog, I’m sharing a Facebook Live video about a special section in my next book, Waking Up in Winter. In the final chapter, I share several provocative questions designed to help you use a time of transition to your advantage. In the video I discuss some of these questions and I extend an invitation, as well. I know that many of you have read my previous books as part of a book club, a Life Makeover Group, or with a few friends, and if you’re someone who does this, I’d like to invite you to participate in a special contest. When you purchase 5 books or more for your group or as holiday gifts, you can send a copy of your receipt to bookclub@cherylrichardson.com and be entered to win a special visit from me to your group via a private Facebook Page (created by you) or by using zoom. In January, I’ll choose 3 groups (maybe more) and we’ll schedule a time to meet at your convenience to discuss the book and to do a little coaching about the transitions you’re facing in your lives. To learn more, and to hear me talk about some of the questions we can ask ourselves during a time of personal reckoning, you can watch the Facebook Live session here. Internationally recognized coach and New York Times bestselling author Cheryl Richardson has toured the world empowering others to make lasting change. But when Richardson’s own life no longer worked as it once had, a persistent, inner voice offered unmistakable guidance: it was time to reevaluate her life to uncover what really mattered. Waking Up in Winter is the candid and revelatory account of how at midlife, Richardson found renewed contentment and purpose through a heroic, inward journey. The unfolding story, told through intimate journal entries, follows Richardson from the first, gentle nudges of change to a thoughtfully reimagined life – a soulful, spring awakening. With an experienced coach’s intuition and an artist’s eye, Richardson reexamines everything – her marriage, her work, her friendships, and her priorities – gracefully shedding parts of herself that no longer serve along the way. 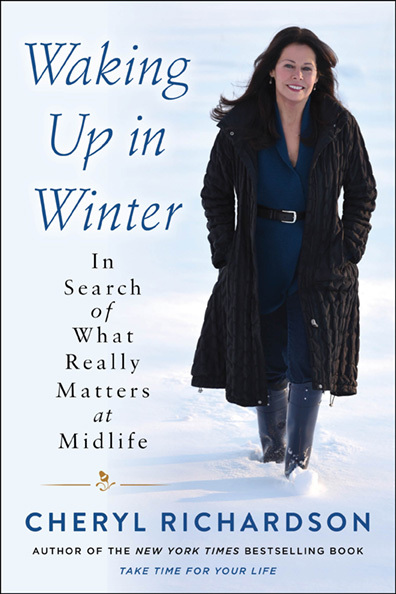 In the end, she not only discovers what really matters at midlife, she invites readers to join her in the inquiry process by providing thought-provoking questions designed to usher them through their own season of transformation. Offering up Richardson’s most powerful teaching tool yet – her own life – Waking Up in Winter takes readers on a brave, spiritual adventure that shows us all how to live a more authentic and meaningful life. I hope this new book – a memoir in journal form – speaks to you in some meaningful way. Thanks, as always, for supporting my work. I really appreciate you . You can preorder Waking Up in Winter, here. P.S. – This week’s Facebook Live Session will be held on Tuesday, December 5th at 6pm EST/3pm PST. If you’re not able to make it, you can find the replay on my Facebook Page and on my YouTube channel at CherylRichardsonTV here.